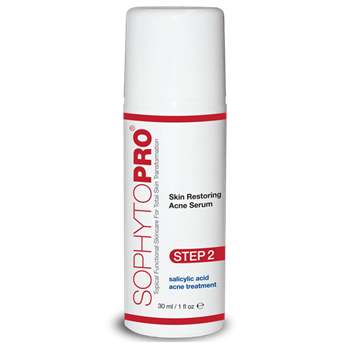 The Skin Restoring Acne Serum is the second step in the SophytoPRO® Skin Restore System. SophytoPRO® is an innovative skin care line that harvests the power of botanicals to promote naturally healthy-looking skin. This oil-free serum is specifically designed to purify the skin and promote the elimination of dead cells. It contains phytonutrient actives that penetrate pores, mitigate P. acnes proliferation, and clear acne blemishes at the source. Unlike traditional approaches, treatment with naturally derived salicylic acid helps reclaim microflora balance on the skin and gently and effectively treat acne. Clinically studied organic black currant and pine fermented extract offer prebiotic benefits, while promoting the appearance of a youthful, vibrant complexion. Pat a couple of drops onto cleansed skin.